As a corollary to my collecting Ackermanns! all the Ackermanns! 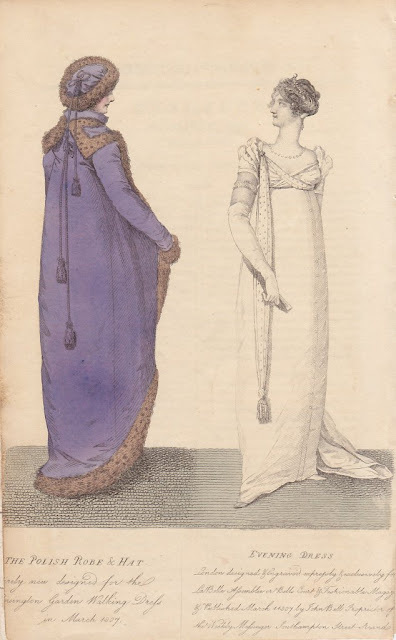 early 19th century fashion prints, I’ve accumulated a number of the advertising supplements that were published along with Ackermann’s Repository and La Belle Assemblée...and they’re worth having a look at. Concealed within the floridly-written, column-inch-gobbling ads for hair oil and patent medicines and ladies’ stays are tidbits that can be surprising and amusing, and definitely open a new window onto the world of fashionable London in those years. 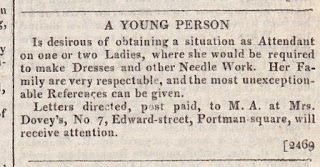 Is desirous of obtaining a situation as Attendant on one or two Ladies, where she would be required to make Dresses and other Needle Work. Her Family are very respectable, and the most unexceptionable References can be given. Letters directed, post paid, to M. A. at Mrs. Dovey’s, No. 7, Edward-street, Portman-square, will receive attention. And for those coffee aficionados among us (raises hand...) – instant coffee and creamer! Not to mention samples! Sold at his manufactory, No. 79, Great Titchfield-street, Mary-le-Bone, London; and by various Grocers, Druggists, &c. in Tow and Country, in Half-pint Bottles. A small tea-spoon full of the Essence, put into a coffee cup of boiling water, with sugar and cream, instantly makes a cup of strong clear coffee. The Essence of Coffee, made from October to April, will keep for years in any climate. 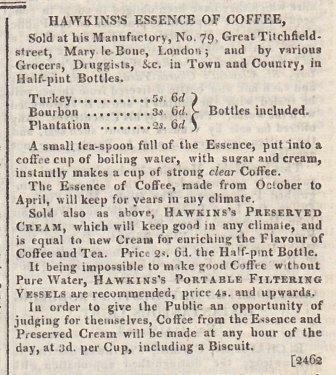 Sold also as above, HAWKINS’S PRESERVED CREAM, which will keep good in any climate, and is equal to new Cream for enriching the Flavour of Coffee and Tea. Price 2s. 6d the Half-pint Bottle. It being impossible to make good Coffee without Pure Water, HAWKINS’S PORTABLE FILTERING VESSELS are recommended, prince 4s. and upwards. 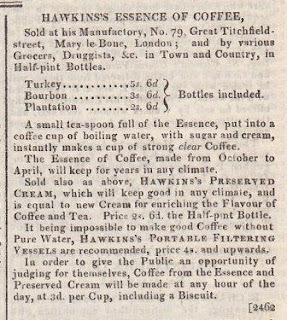 In order to give the Public an opportunity of judging for themselves, Coffee from the Essence and Preserved Cream will be made at any hour of the day, at 3d. per cup, including a biscuit. Including a biscuit? I'm in! 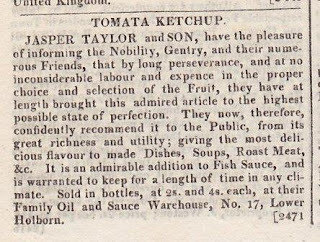 JASPER TAYLOR and SON, have the pleasure of informing the Nobility, Gentry, and their numerous Friends, that by long perseverance, and at no inconsiderable labour and expence in the proper choice and selection of the Fruit, they have at length brought this admired article to the highest possible state of perfection. They now, therefore, confidently recommend it to the Public, from its great richness and utility; giving the most delicious flavour to made Dishes, Soups, Roast Meat, &c. It is an admirable addition to Fish Sauce, and is warranted to keep for a length of time in any climate. Sold in bottles, at 2s. and 4s. each, at their Family Oil and Sauce Warehouse, No. 17, Lower Holborn. Not sure they were putting it on their fries (or should I say chips? ☺) but hey, there you go! Did you find this interesting? Shall I post about any other ads that tickle my fancy or talk about something unexpected? Very few of us pick up a book without first looking at the cover. Indeed, covers can draw you to a book you wouldn’t have considered otherwise. I have been blessed with some lovely covers over the years. (We won’t speak of the unlovely covers—they tend to get jealous.) But I have never, in working with six different publishers, been treated to a more amazing process than that for the cover of my October 2019 release from Revell, A Distance Too Grand. Grand is set on the North Rim of the Grand Canyon in 1871 and features a photographer heroine who wrangles her way onto an Army survey team only to discover the man leading the team is the one she thought she had left behind. As is often the case with publishers, I was asked what I thought would make a good cover and provided details on what my heroine and hero looked like, what they wear in the book, and the setting. I expected that to be that. What has generally happened in the past with other publishers is that I would get a nearly finished product at some point and beg to have any inconsistencies fixed. Sometimes timing demanded that those inconsistencies remained to publication. It is what it is. I first received an e-mail from the Art Director introducing herself and explaining the process. A short while later I received another e-mail from this wonderful person who I intend to hug if I ever meet her in person. She sent a picture of an antique camera. They bought an antique camera. Friends, this doesn’t happen. 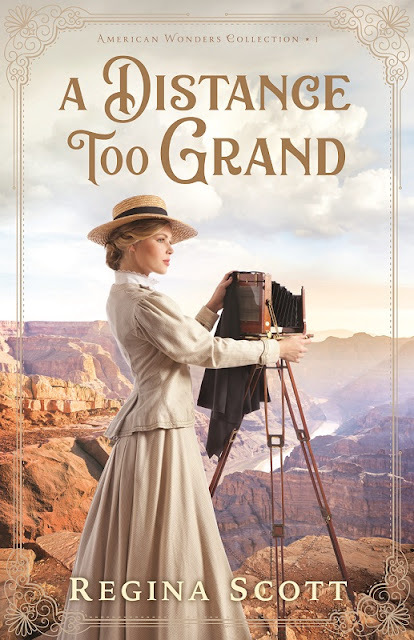 If a publisher wants a suitable looking camera for a cover, someone will find some sort of clipart that sorta, kinda resembles a camera from the 1800s and force-fit it into the composition. Not this time. The next e-mail provided pictures of a model they hoped to use for Meg. She too was perfect. I was thrilled. The next e-mail apologized that they could not find a navy riding habit that exactly matched the picture I had sent. Would this dress do instead? 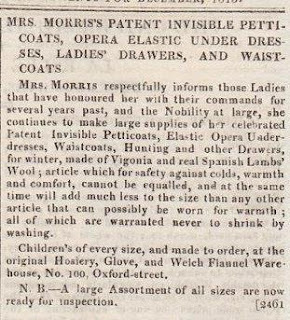 I found myself looking at an antique dress from the time period, with a narrow skirt and a bustle. 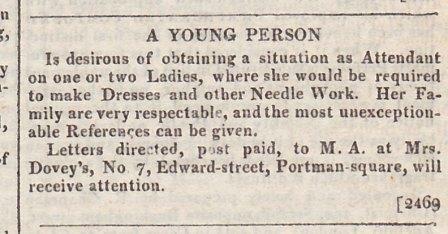 They were going to rent an authentic outfit from the 1870s. Sadly, Meg could not have worn it on horseback on the survey. I made some suggestions about fudging—using a modern riding habit jacket and painting on the right buttons, using a modern A-line skirt. The next e-mail offered two cream-colored riding habits of perfect dimensions, also museum pieces that would be borrowed for the photo shoot. I agreed the one the Art Director liked was—yes, you guessed it—perfect and waited breathlessly. To say I am delighted is the understatement of the year. This is one of the most beautiful covers I’ve ever had, and the most historically accurate. I feel blessed. I hope you’ll look for A Distance Too Grand in October. If you just can’t wait, it is available for preorder in print now (I expect e-book to come) from Amazon. The Book or the Movie...or Maybe, the Book AND the Movie? I’m taking a little break from the 19th century this week because I’ve been having far too much fun making book teaser videos again (bad Marissa! No cookie!) Sometimes creativity needs more than one outlet, right? And speaking of Skin Deep...now is a good time to remind you that Barnes and Noble’s on-line #NookBookBash has just one week left to run. What’s #NookBookBash? It’s Barnes and Noble’s special offer of over two hundred books in a range of genres—mystery, science fiction, thrillers, romance (including Skin Deep—there, you knew there had to be some tie-in! )—that you can download for free with a special coupon code... and if you like what you read, there’s another coupon for getting the next-in-series books for 25% off. You don’t need to own a NOOK device to read—you can download the free NOOK app to your computer, phone, or tablet. 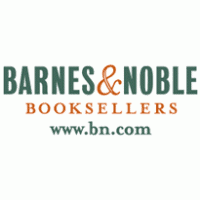 1: Visit https://www.barnesandnoble.com/b/nook-book-bash/_/N-2s47 on your desktop or device (coupons cannot be redeemed on a NOOK device or inside the NOOK app) and snap up your next favorite reads. 4: Apply Coupon Code NOOKBASHFREE below the Order Summary. 5. Complete check out. Your new books will automatically appear in your NOOK library. 6. And hey presto! You’ve got books! There are no limits—you can get as many of the offered books as you want! To get the next-in-series book, check out the Second Book list on the same page, and at checkout, use coupon NOOKBASH25 to get 25% off those titles. The only tricky bit is that you can’t use both coupons in one transaction, so get your free books first and check out for any sequels separately. Feel free to pass this on to your friends, but time is running out--the offer is good only through February 28, 2019, so stop by soon! Happy shopping! Sounds rather macabre the day after the holiday devoted to love, doesn’t it? But I was recently reminded that I have a wonderful late nineteenth century/early twentieth century Valentine courtesy of the great-great aunt who left me her postcard collection, and I wanted to share. It’s built in layers of paper. Each layer isn’t as thick as card stock, but definitely thicker than typical stationery. They are mounted on accordion hinges of the same sort of stock. Alas, everything is pretty flat after nearly a hundred years in a photo album, but you can see where this was once a rather impressive three-dimensional anthem to love. 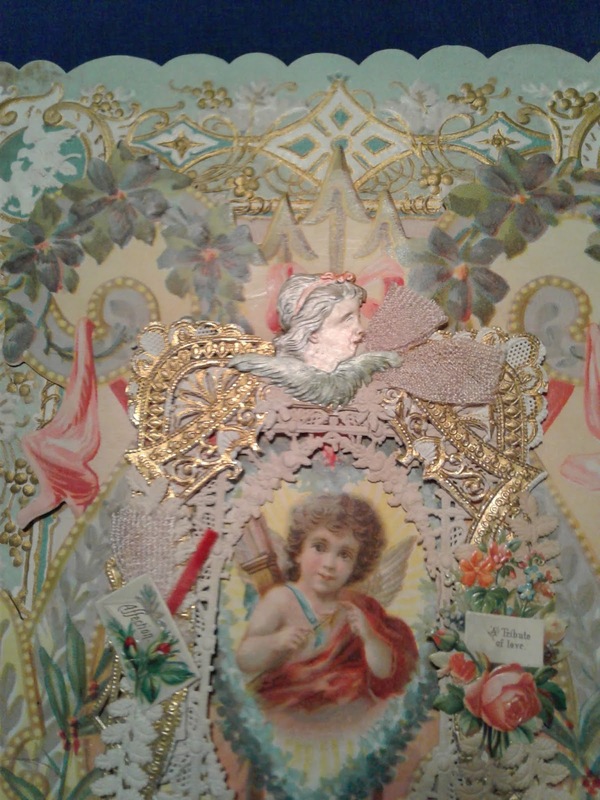 The pieces surrounding the center cherub are made from different materials. The red ribbon is silk, the white a kind of cross-grain fabric. The gilding appears to have been hand-applied. 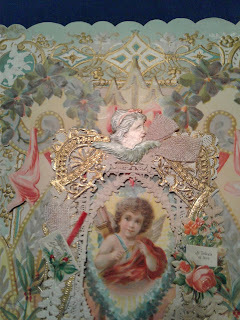 And some of the white lace is fabric bric-a-brac. Nothing on the back or front indicates who created it or where. Inside is a lovely poem promising life-long devotion, but no signature. 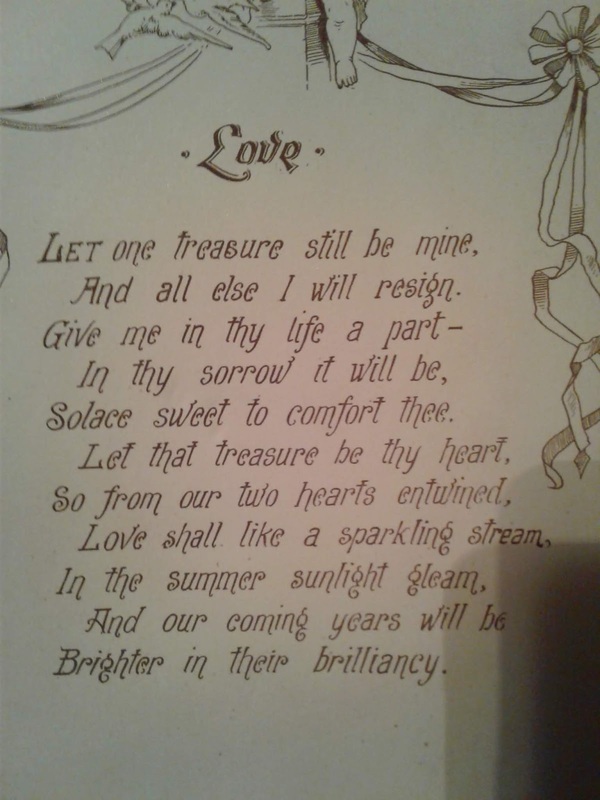 I don’t know whether my great-great aunt received it from someone she loved or bought it and never sent it. Oh, the story possibilities! 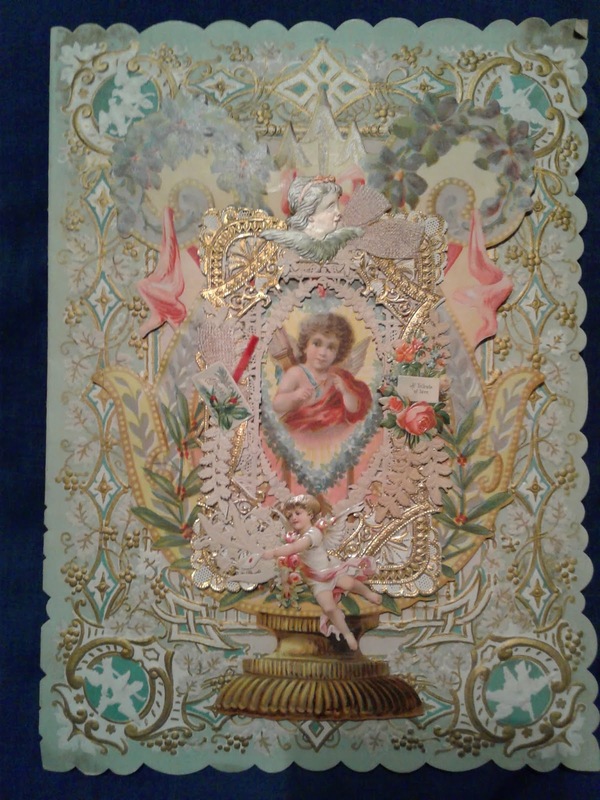 All in all, it’s about 11 inches tall and 8 inches wide, and I don’t think the colors have faded much with time. Any lady would have been pleased to receive it. I am quite delighted my great-great aunt thought to leave it for me. And now you! Happy belated Valentine's Day! 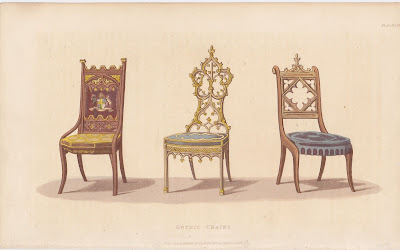 Time to show you the last few delicious prints of Gothic furniture from my collection of prints from Ackermann’s Repository! Part 1 can be viewed here and Part 2 here... and here we go! 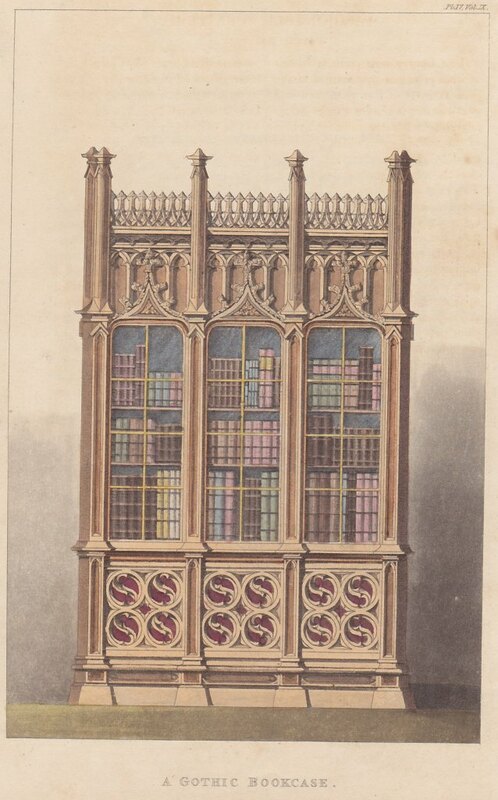 A similar confession accompanies the description of this Gothic Bookcase (exact date not known, but it was published in the first half of 1827). It reads, “The library now constitutes one of the principal apartments in the country-seats of our noblemen and gentlemen. No style can be better adapted for its decoration than that of the middle ages, which possesses a sedate and grave character, that incites the mind to study and reflection. The rays passing through its variegated casements cast a religious light upon the venerable tomes on either side, the beautiful arrangements of its parts combining to produce an impressive grandeur in the whole design. Every thing proclaims it an apartment consecrated to learning. 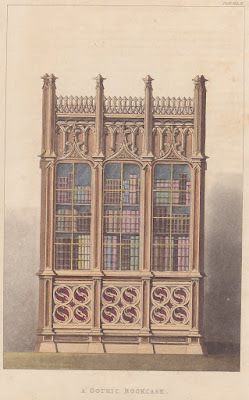 All mansions, however, are not sufficiently capacious to admit of devoting a whole apartment to this purpose: bookcases have therefore been resorted to, which form a most excellent substitute; as, while fulfilling the purpose of a library, they form handsome pieces of furniture, which can be well applied in filling up recesses and other inequalities in a room.” So again, not so much a gothic bookcase as a bookcase in the gothic style...but no matter what, I wouldn’t mind a few of these...so long as I kept them on the bottom floor of my house! 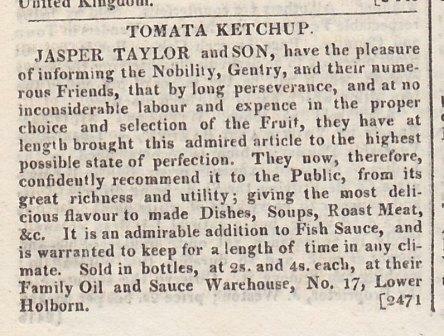 Alas, I do not have the accompanying text for our last print from the July 1827 Ackermann’s Repository. 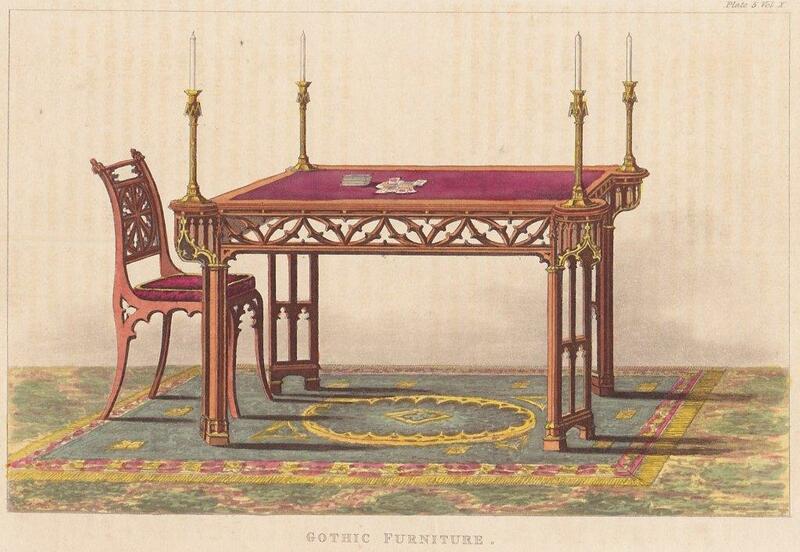 It is labeled “Gothic Furniture” but is clearly a card table. I love the areas for equally Gothic candlesticks at the table’s corners, the tracery on the table’s apron, and the legs modeled to look like cathedral windows—rather an amusing juxtaposition for a gaming table! 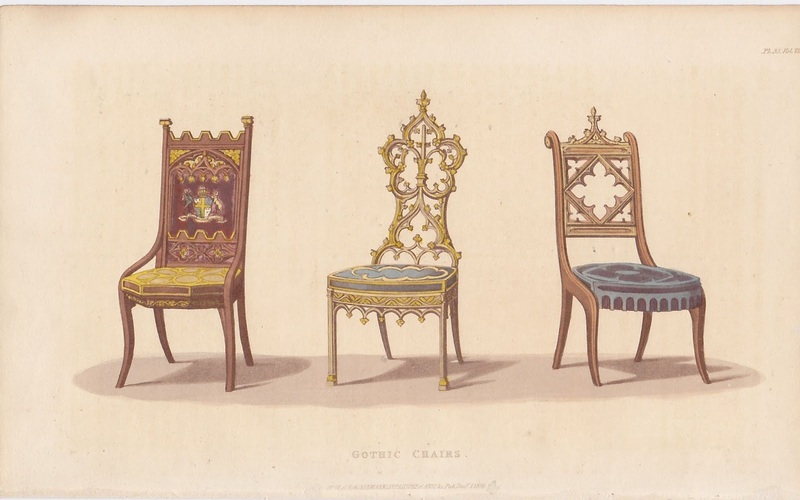 I hope you enjoyed our look at Ackermann’s ever-inventive Gothic furniture styles. Any favorite pieces? No. 1 – Walking Dress. 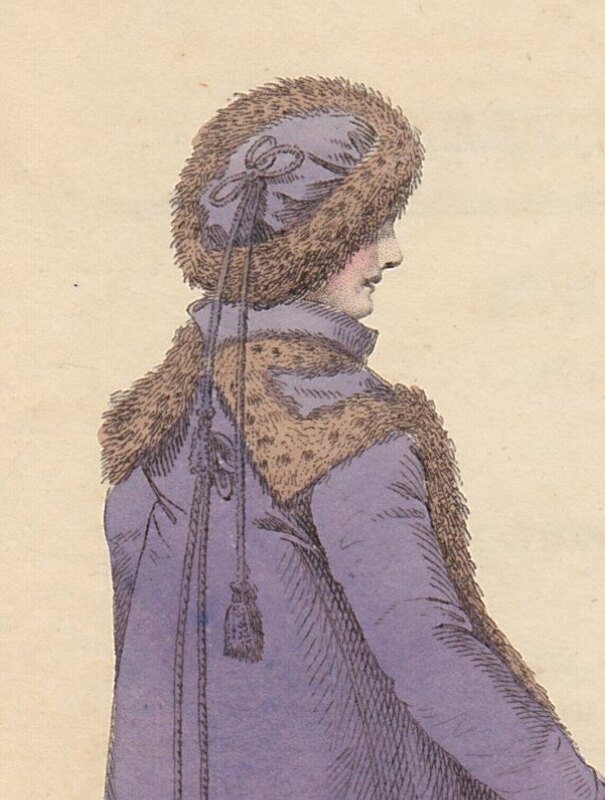 A Polish Robe of purple velvet, flowing open in front, rounded gradually from the bottom towards the lapels, which are continued across the back. A chemisette of the same, with high full collar; the whole trimmed entirely round with the red fox, mole, leopard spot, or grey squirrel. A rich cord and tassel fastened in the center of the back, which occasionally confines the robe. The back and skirt cut in one; and the sleeve nearly to fit the arm. Polish cap of the same material, trimmed round the edge, and across the crown, with correspondent skin; a cord and tassels suspended in irregular lengths from the right side of the crown. York tan gloves; and primrose, or purple shoes. Wow! The hat—the swinging cords—the purple—what’s not to love about this ensemble? It just looks sooooo cozy in an over-the-top sort of way; I’m sure this outfit would turn heads when worn on a stroll in Kensington Garden. But since wearing a cozy purple velvet pelisse in Kensington Garden is not something most of us can do this winter, I’ve got another idea that might keep you warm—because there’s nothing better to do on a cold, blustery day than curl up and read! Barnes and Noble is running their first #NOOKBOOKBASH--a special offer of over two hundred books, many of them first-in-series, ranging from romance to science fiction to mysteries and thrillers—all FREE with a special coupon code...and if you like what you read, there’s another coupon for getting the next-in-series books for 25% off. You don’t need to own a NOOK device to read—you can download the free NOOK app to your computer, phone, or tablet and read 'em there. Feel free to pass this on to your friends—and the offer is good through February 28, 2019, so you have plenty of time to browse. My own Skin Deep is on offer there—go have a look, and stay warm with a good book!